I posted a few pictures in the introduce yourself section, but rather than follow a build there, I thought I should put it in the appropriate place. 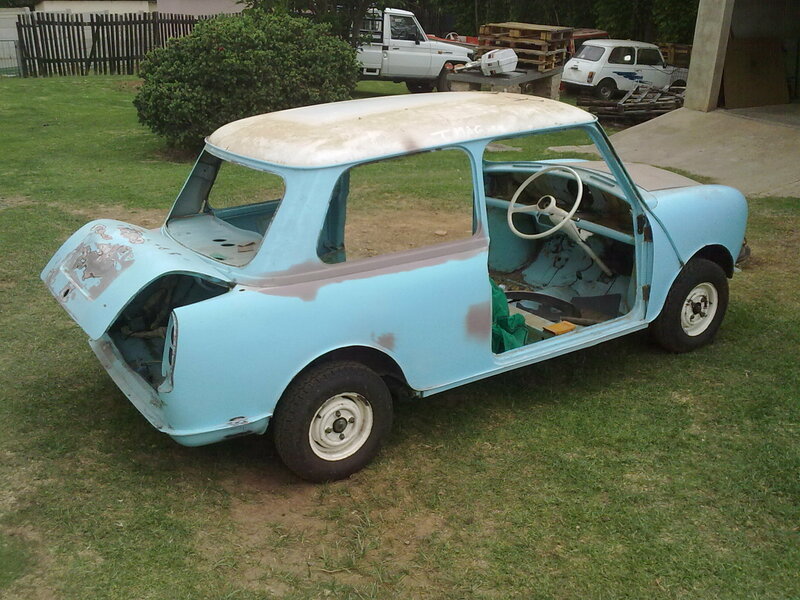 As I said, the car is a South African built Mk3, essentially a Elf/Hornet with a normal Mini nose. Unfortunately I lost some photos of the beginning of the build, but I have a few extra ones to add here. Thats coming on nicely, do keep the photos coming and thanks for putting it on the correct thread, saves me having to do it! I'm new to this forum, so I didn't want to step on any toes, that's why i decided to move it. So it wasn't a problem at all. Just for interest sakes, I remembered that I sent some photos of my car to MiniWorld when I got her way back in 2008 or so. Two pictures were shown in the reader's car section of the February 2009 issue, should anyone be interested in seeing what it used to look like. I haven't done much to the car of late, but I have managed to restore the gauge pod. It isn't authentic, but then again, the car isn't being restored back to original condition just yet. The reason the pod is now gloss is that it was sprayed after the previous owner attempted to fix it themselves, but just made a mess of it. 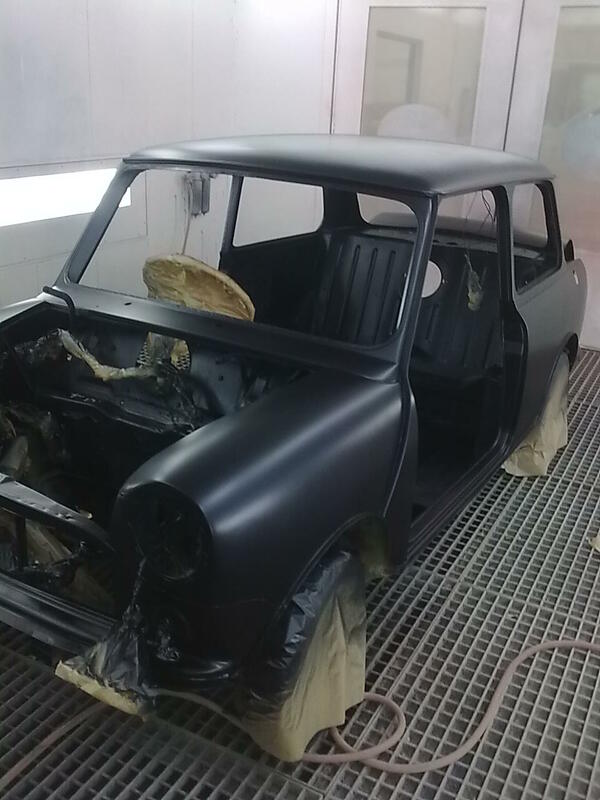 Naturally plastic primer was sprayed on first so that the paint doesn't lift. The gauges themselves were also cleaned up and the chrome trim given a good polish. The glass faces were also cleaned, but due to the car's 42 years of use, these are no longer perfect. 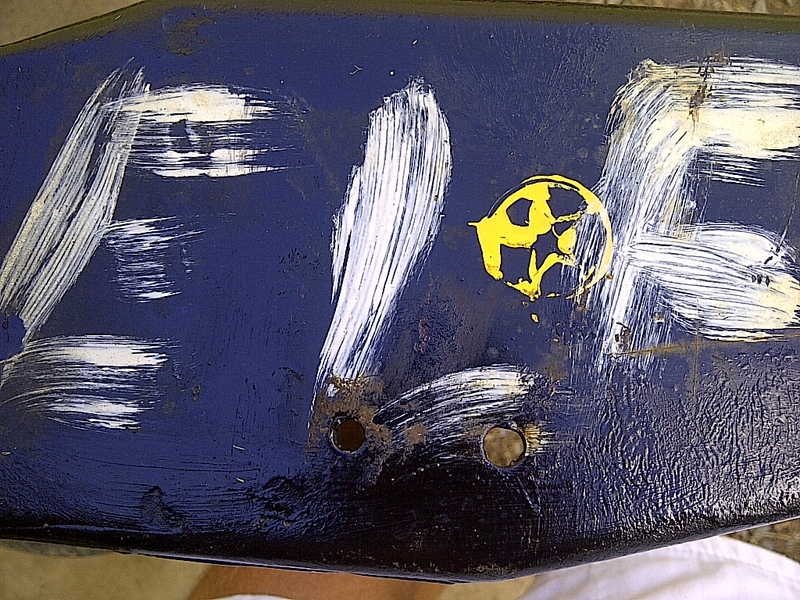 I suppose it gives the car a certain patina now. Along with the gauge pod that was restored, I managed to fix up an old heater unit that I bought for my car, as due to the hot climate here in South Africa, it was deemed unnecessary to fit one. It was repainted and new sponge fitted on the inside. Also, I got a custom fascia sticker made up by Sticky Fingers for that custom feel on the inside of the car. Also, I managed to pick up a driver's handbook for my car in an antique dealer's store not so long ago. Apart from the small bit of obvious wear on the covers and the small mark left by the price tag, the book is in very good condition. I cleaned up the door locks of my car after many years of use and grease and grime. First up was a good clean with a general purpose degreaser and then a polish with metal polish to get them looking a little better. I then used the same metal polish on the door trim and cleaned up the door cards with detergent. Apologies for the bad pictures. 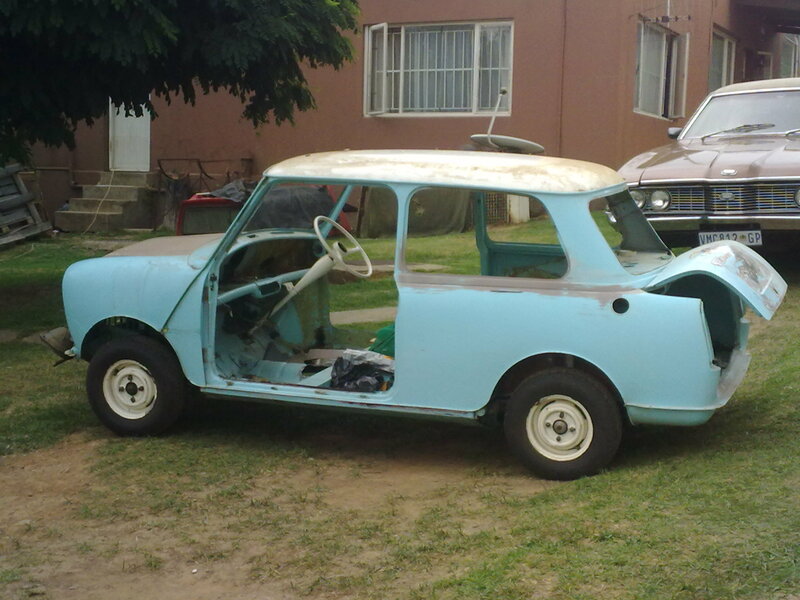 Jared Mk3 wrote: Along with the gauge pod that was restored, I managed to fix up an old heater unit that I bought for my car, as due to the hot climate here in South Africa, it was deemed unnecessary to fit one. It was repainted and new sponge fitted on the inside. Also, I got a custom fascia sticker made up by Sticky Fingers for that custom feel on the inside of the car. My daughter's boyfriend works for Sticky Fingers, so I was given these for my Mini Sky! That looks really neat. It's amazing what such a small thing can do to change to look of the interior. They are on Ebay all the time. Its not so much a hassle in getting, I was wondering rather if both of said gaskets have to used per tail lamp? Also, we removed the front subframe of my car and had trouble removing the one track rod end. 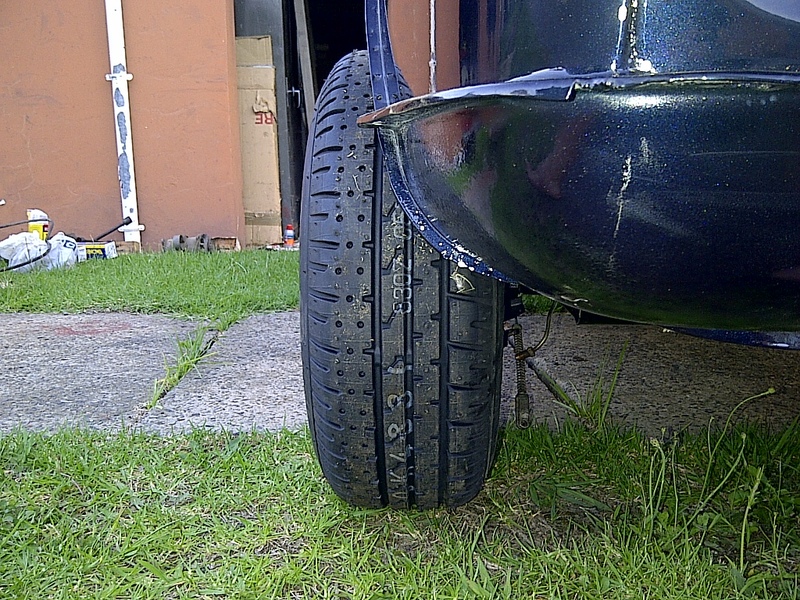 The driver's side came off easily enough, but the left hand side will not budge at all, even after applying WD40. We removed the steering rack along with the subframe. Any suggestions? just one gasket per side of the car is needed. careful grinding or heat and hard spannering? I forgot to mention that the track rod end in question is still attached to the steering arm and won't come loose from there. Someone has replaced it before and over tightened it, thus it won't come loose. Due to the difficulty of obtaining good quality tail lamp lenses in this country [due to the harsh sun etc], I have subsequently battled to find some. The ones I manged to find were in very bad shape and only one of the original sets was worth keeping. After searching for a long time I managed to find a set that was in very good condition, apart from the fact that they needed a good clean. A few of the bits and pieces. I also managed to fix up the switch panel using some of the new switches and cables from the aforementioned order. 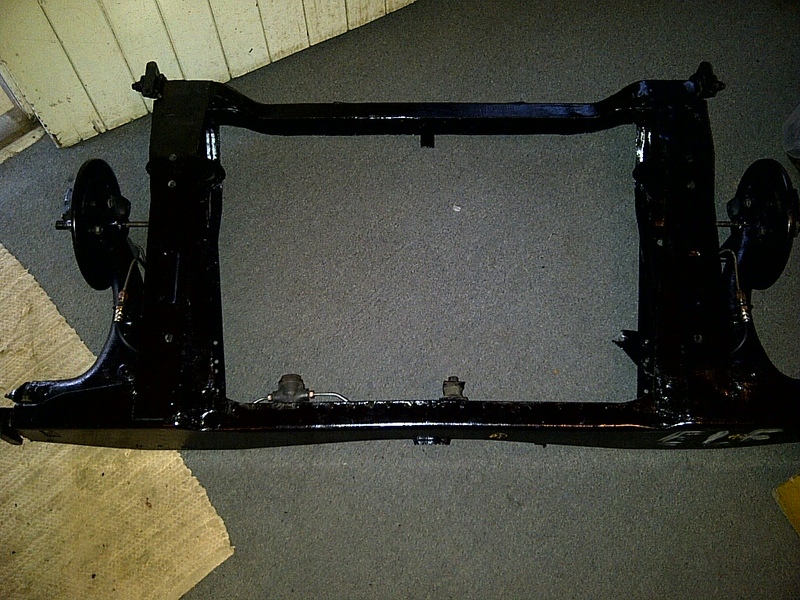 And lastly, the front subframe before strip down. I finished with the refurbishment of the tie bars today. To be different I sprayed them a different colour, just to give them that sporting appeal, even though they're still the standard items. To this I also added the Minispares uprated bush kit. Not too shabby if I say so myself. Not as yet, as soon as the subframe is refurbished and back in place, I will upload some more pictures. 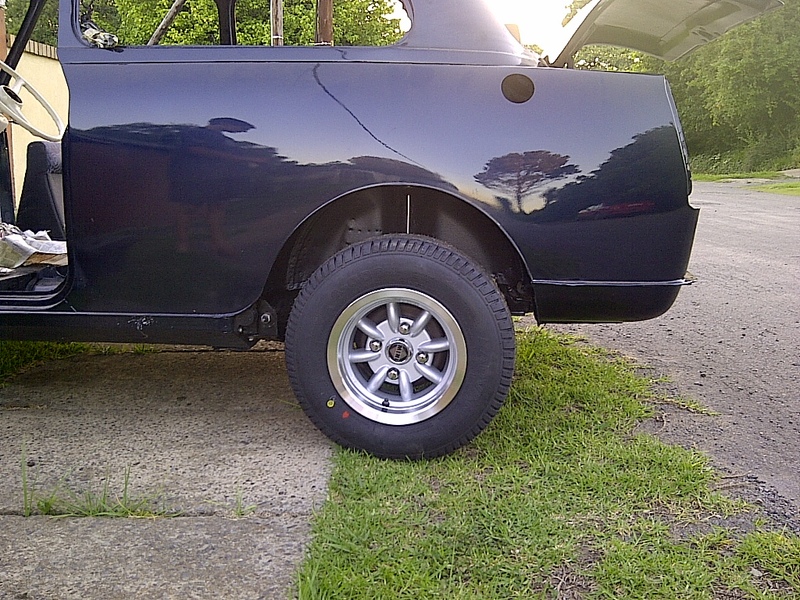 I managed to refurbish the steering rack with new boots, track rod ends and some fresh oil. Right, so the weather hasn't exactly been on my side in the past few weeks, but I have managed to accomplish a few things. 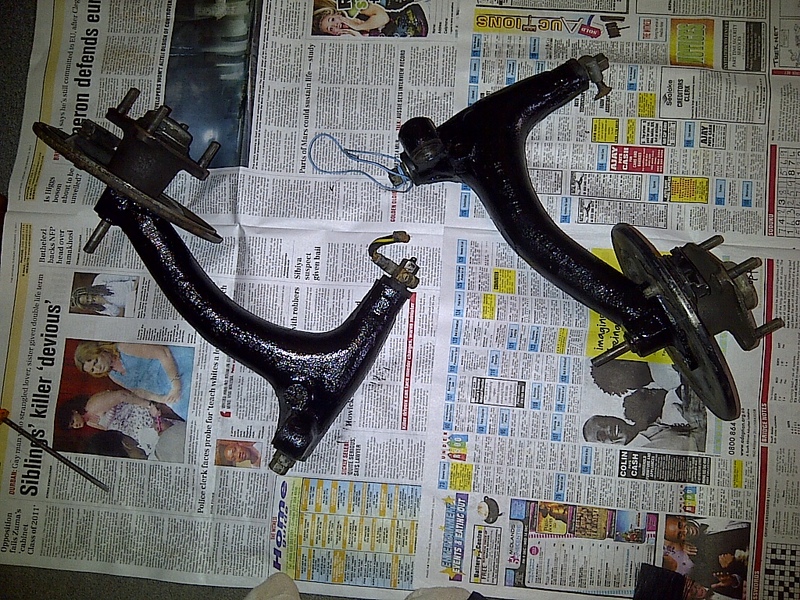 Including the tie bars that were refurbished, the lower arms were also redone, with new bushes. The upper arms followed with a good clean and a new lick of paint. Along with all this, I managed to get some good rubber springs off of one of the other cars on the property. As you'll be able to see in the picture, the one on the left is the less abused one after a clean and a little paint, and the one on the right is the original. Just some pictures of the front subframe roughly 50% complete, now with top and bottom arms and tie bars, new bushes and the better rubber springs. It's a little dusty, but you get the just of it.